Coach pitch is a modified game of softball that builds on striking and fielding skills. Coach pitch introduces the skill of hitting a pitched ball. Form 1 batting team and 1 fielding team. Players take it in turns to bat the ball, which is pitched underarm by the coach or opposition. The batter runs around the bases while the fielders field the ball. Each batter has 3 attempts to hit the pitched ball. If the player fails to hit the ball into play, the batter may hit the ball from a batting tee. Where should you stand to field the ball? 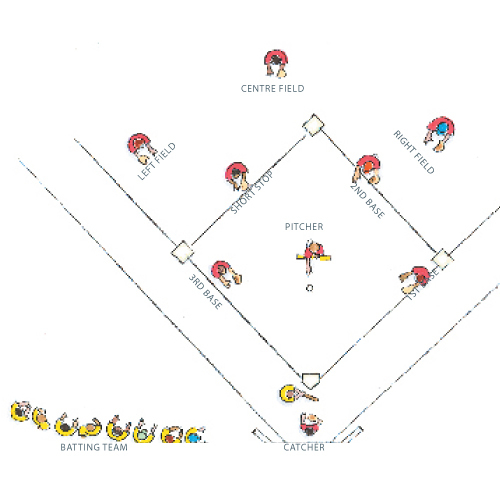 Where is the best place to hit the ball so you can reach 1st base?